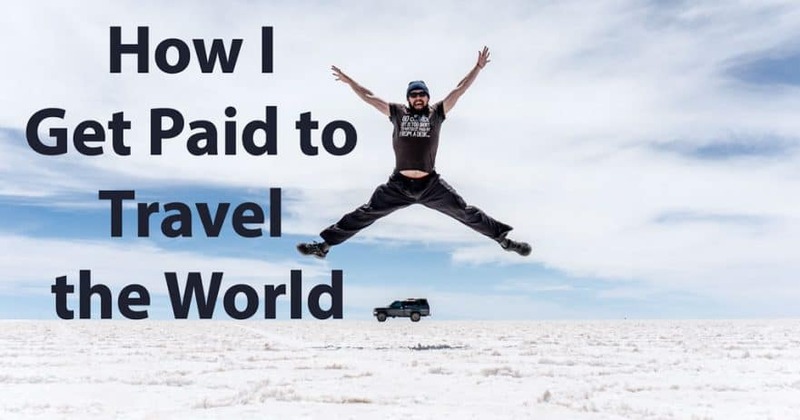 After traveling the world for the past five years, one of the most common questions I receive is: “How can you afford to keep traveling so long?” “How do you earn money?” or “How do you get paid to travel?” Well, here’s my answer, although it is different for every travel blogger. Working as a full-time freelancer and professional travel blogger has been a dream come true, but it has taken a lot of hard work to get here. 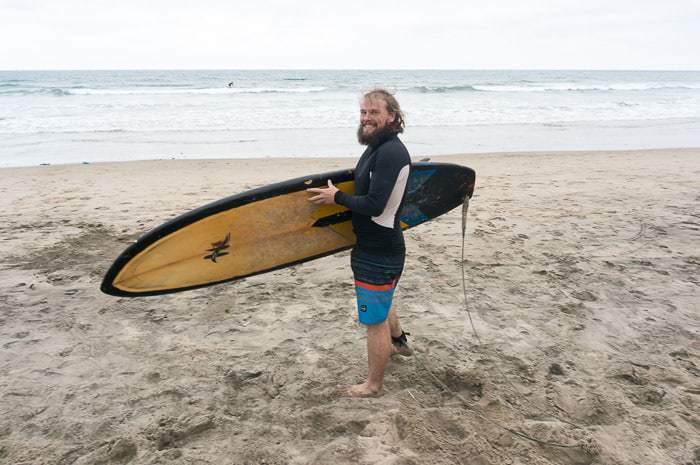 From the outside, many people think I’m basically on a permanent vacation, but the reality is far different, and there’s definitely a lot more going on behind the scenes that you might not be aware of. Obviously, you need to make a living in order to afford to travel, unless you’ve got a trust fund or a rich uncle or something. In order to fund my long-term travels, I make money in a variety of different ways, from a variety of different sources, and these sources of income sometimes change from year-to-year or even month-to-month, but I’m going to cover the gamut of how I’ve managed to sustain this travel lifestyle. 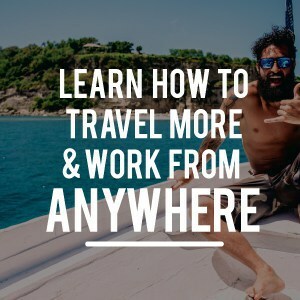 Get Paid to Travel the World? Yeah, it sounds like something too good to be true. I know I thought the same when I started dreaming of hitting the road as I sat at my desk. Indeed, it was something I fantasized about for years, but was only compelled to finally take action when I lost my job at the end of 2012. What was only going to be a year-long break turned into years of continuous travel, thanks to my ability to make ends meet (sometimes barely). Honestly, I didn’t realize just how cheap it is to travel before, and how it’s actually cheaper to travel the world than stay home. Yes, that sounds crazy, but it’s true. Budget travel is incredibly freeing, and there are plenty of ways to travel the world on a budget, some of which I learned through sheer trial and error. In order to initially set out I put aside as much money as I could to build up my travel fund. While I had a decent job working in Washington D.C., I was also living in one of the most expensive cities in the country, so it wasn’t always easy to save. The “secret” if you want to call it that, was that I embraced minimalism and downsized my life heavily. I sold off things I no longer needed, I limited how often I’d go out to bars or restaurants, I shared a crummy house in order to avoid paying steep D.C. rents. This is the part of setting out for long-term travel that isn’t fun and requires quite a bit of discipline. But it’s definitely worth it in the long run, trust me. Read more of my tips about how to save money for travel. When I first set out, I had no plans of continuing beyond one year. It was my sabbatical from the working world, when I became a climbing dirtbag, living in my truck and setting out on a road trip of the American West. 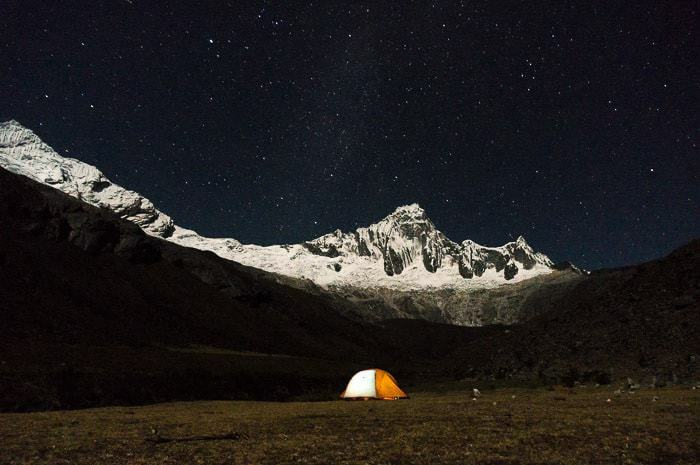 As the year ran up, I also found my money supply running out, so I traveled to Colombia with a buddy where my money would go a lot further in pesos. It was here when I started to really try and figure out how to make this work and how I could survive long-term without going back to the traditional 9-to-5 desk life. If it wasn’t for freelancing, there is no way I could have kept traveling this long. Freelance work that you can do online from anywhere in the world (so long as you have internet) is about the fastest way to freedom. Freelancing is what I recommend to everyone who reaches out to me about how to afford long-term travel, and is something I’d recommend you get started with even before setting out to travel. It’s something I wish I would have started sooner, as well. You can find freelance work in just about anything, but freelance writing has been my bread and butter for the past few years — and it is still something I rely on to make ends meet, the only difference is my rates increased alongside my growing experience and references. Check out this post of 40+ freelance, side hustles for more ideas. Save a travel nest egg to get started. Long-term travel is surprisingly cheap, often much cheaper than your current cost of living. Mix in a modest online income with budget travel or a low cost of living in some incredible countries where the dollar goes far (popular choices are Asia and Latin America), then you’ve got the recipe for long-term travel. Even if you aren’t covering your full cost of living in the beginning, that income supplements your savings and you might be surprised at just how long you can keep traveling (meantime you are also hopefully growing your income as well). Check out my Side Hustle Calculator for an interactive idea of how much longer you might be able to travel on savings thanks to a modest freelance gig. Freelancing has one inherent downside though, and that is you are still continuing to trade your time for money like a traditional job, even though you are location independent now. That’s why I’ve really dedicated myself to diversifying my blogging income sources and working on generating passive income — aka income that continues to earn day-after-day whether I am sleeping, off camping for days on end, or just momentarily taking a break from the blog (you do burn out). Occasionally I will partner up with gear manufacturers or other companies in order to promote their products. These could take place in the form of sponsored posts, content, or newsletter mentions. To be honest, I don’t do much of this, although it is a common and widespread source of income for many bloggers. Too often to me though, this type of relationship feels sleazy and corruptible, and I will only partner with companies whose products or services I already use or I actively want to use. This selectivity makes it more difficult, but I prefer to maintain my integrity (I wouldn’t feel good recommending junk because someone is paying me) and I also maintain my readers’ trust. How Much? I earn around $100-300 for simple one-off partnerships. Whenever I share my favorite outdoor or travel gear, recommend books or movies, hotels, tours, or online courses that I use and love, I include a special affiliate link. This means that if you click through and decide to make a purchase, I earn a small commission (percentage based) at no additional cost to you. For an example of an affiliate heavy post, check out my Truck Camping Gear store. Some of the affiliates I use include Amazon, REI, Backcountry, Get Your Guide, Booking.com and others. How Much? I earn between $300 and $500 per month. Destination marketing, aka working with hotels, tour agencies, tourism boards, and more, are one of the most common reasons some people want to become travel bloggers. For most travel bloggers, this means freebies in exchange for promotion. Some bloggers, especially those at the top, actually get paid to travel and earn a fee in addition to the freebies. This is also something I haven’t spent much time pursuing, because I often find it more worthwhile to invest my time actually traveling, writing, and living life, rather than chasing down leads. But I have done it at times for adventure activities (either free or discounted), staying in unique hotels, and so forth. While this doesn’t put money in my pocket, it does save me a considerable amount on things that I really wanted to do, but couldn’t really afford. How Much? In my pocket $0, but in savings $100-200 (although this is something I pursue maybe once or twice a year). You’ve seen them pretty much everywhere, the Internet is covered with ads. The most popular ad platform is Google Adsense, whereby they insert ads in a site and every time a user clicks you earn money. There are many different ad platforms, but you typically need to have a lot of traffic in order to make a fair bit of money. I never really used Adsense because the earnings were terrible. Previously I used Amazon ads, and was only earning about $1 per day, and that won’t keep you traveling for very long at all. If you do receive a fair amount of traffic, you can apply for more lucrative ad networks like Mediavine (what I currently use). This has resulted in earnings of about $60-80 per day which is a little bit more respectable. How Much? Around $2,200 per month. 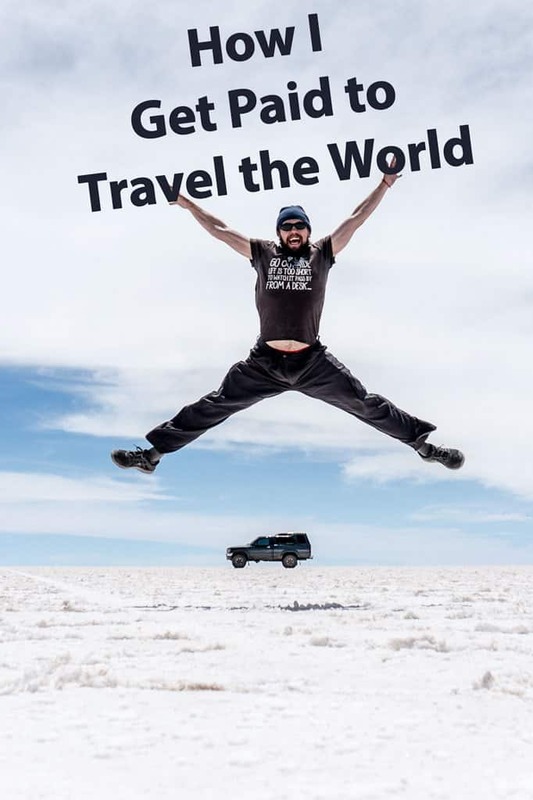 After I few years of travel I learned quite a bit about how to travel on a budget, so I decided to write a book about it. 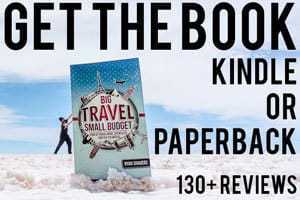 My book Big Travel, Small Budget has been a mini-success for sure with well over 100 reviews on Amazon, and lots of awesome feedback from readers who have put the information to use. Earnings from book sales are also a percentage, typically 70% of list price on Amazon, and you are free to list your book at the price point you deem appropriate. How Much? I earn around $150 per month from sales in Kindle and Paperback. More recently I’ve expanded to include a line of physical products, mostly t-shirts and stickers. I’ve got products related to Desk to Dirtbag, truck camping, and just inspirational messages. It’s a way for readers to show their support of the site, or feel like they belong to part of this awesome community I’ve built up over the past few years. How Much? I earn from $5-50 per month for the sale of physical products. There are plenty of other ways to earn money online that are employed by travel bloggers. How Much Do You Earn Overall? Well, I do regularly post income reports that detail how and where I earn money related to my blog, although I don’t include freelance income. Freelance income still makes up the majority of my earnings each month, but the blog helps smooth out any potential dips, provides a baseline security net when projects end, and is obviously something that generates returns even when I’m not actively working (or have internet). But even with the freelance income and blogging income, I’m still earning less than I used to while working a full-time job — but that makes sense because I’m definitely not working full-time. Freelance work may take up half a day a few times per month, and working on my blog may take up perhaps the equivalent of a week of work during the month (although there are times where it is much more or even much less). I’m not wealthy, I’m not even middle class in the United States, but I’d still gladly trade the freedom I’ve got now for the security of a desk job. I’m also convinced that embracing uncertainty and taking on some calculated risks is one of the best things you can do in life. So yeah, the whole question of how to get paid to travel the world is a bit more complicated than it first appeared. Honestly, it isn’t easy. If you’re looking to get started, I would focus squarely on freelancing. Blogging is not where you should focus if you’re looking for quick returns, but it can be a viable long-term strategy and even a profitable business. But please note, I really do mean long-term. If you’re hoping to make a living while you are taking a gap-year, you will probably be disappointed. But if you hope to make this a long-term lifestyle choice, you can make it work if you focus both on freelancing and on a personal blog, and yes, you can actually get paid to travel the world. How to Start an Adventure Travel Blog – This is my step-by-step guide to getting your blog up and running in no time. Superstar Blogging – This is an excellent course from Nomadic Matt which has helped me take my blog to the next level over the past few years. 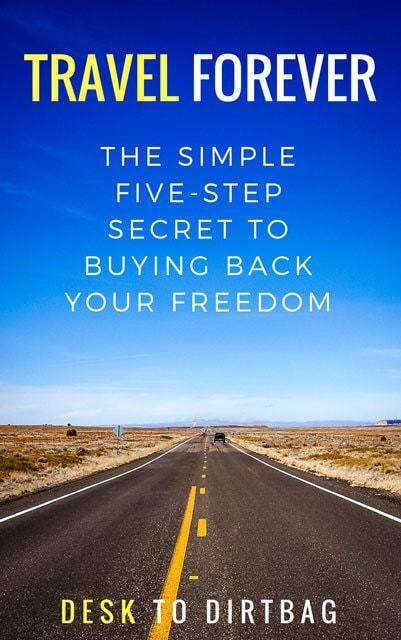 Big Travel, Small Budget – This is my own book about how to save big money while traveling the world, tactics that will give you the breathing room to travel and launch a freelance biz. Get Paid for Your Writing – An excellent guide that will help you break into the world of freelance writing and get paid to put word to paper, one of the main reasons I’ve been able to sustain my travel. I have been enjoying reading some of your posts. You got a great way to saying it like it is. I think your very motivating and encouraging. Continue doing what you love. Have any favorite spots in Oregon yet? We’re at the beginning of our desires to work and travel more. Hope to offset accomodations with caretaking and slowly build up freelancing and blog content. Looking forward to following your adventures. Thanks Dennis! Appreciate the kind words… Favorite spots in Oregon — that’s tough because there are so many… Spent a lot of time traveling down there when I was young and a little bit of time as an adult. I love the whole of the Oregon coast (but especially the area on Cannon Beach, Tillamook, Astoria, etc), the Columbia River Gorge is like the best, Bend and Smith Rock is cool, love Crater Lake and Mount Hood, Portland itself is a lot of fun. Those are the places I’m most familiar with and love. Happy adventures! I’m hoping to transition into full-time blogging and YouTube creation but I have never had my patience tested more in any other aspect of my career or life! I’m having to work a “regular” job to pay for my travel, and my survival, until I can get enough traction to make it. Fortunately I work remotely from anywhere with an internet connection – definitely helpful when trying to to stay away from home as much as possible! Yeah, I hear you, it can be a tough go, especially in the beginning. Don’t forget to speak with an accountant about maximizing your tax deductions for related business expenses… It can be helpful in order to maximize any meager earnings. I have been in an area with limited internet access, thus I check things and read them later when I have better access. Keep it up, there are many that don’t have the mindset to get out of the box. 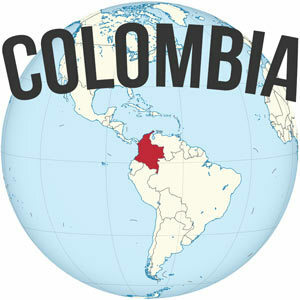 your page is helping us plan our trip to Colombia and the things to do! thanks so much! My husband and I have been freelancing (data science) for over a decade. I can attest that this is a great way to make location-free income. Maybe three or four times a year we have to be in a specific place at a specific time. Otherwise our schedule is our own. All hail the internet! The internet is a pretty incredible thing, isn’t it? Great information, Ryan! Keep up the inspiration! Thanks Brian! Glad you enjoyed the post.